16 Best Child Motorcycles and Scooters! Best Motorcycles and Scooters for Kids! Are you looking for the best and coolest child motorcycles today for your little ones? You won’t believe how many cool motor bikes for kids there are! Every time I found a new one to display here I let out a scream! As a girly lady, my favorite ones are the cute pink motorcycles for girls, of course, but I also went crazy with the cool police bikes and gorgeous child scooters! 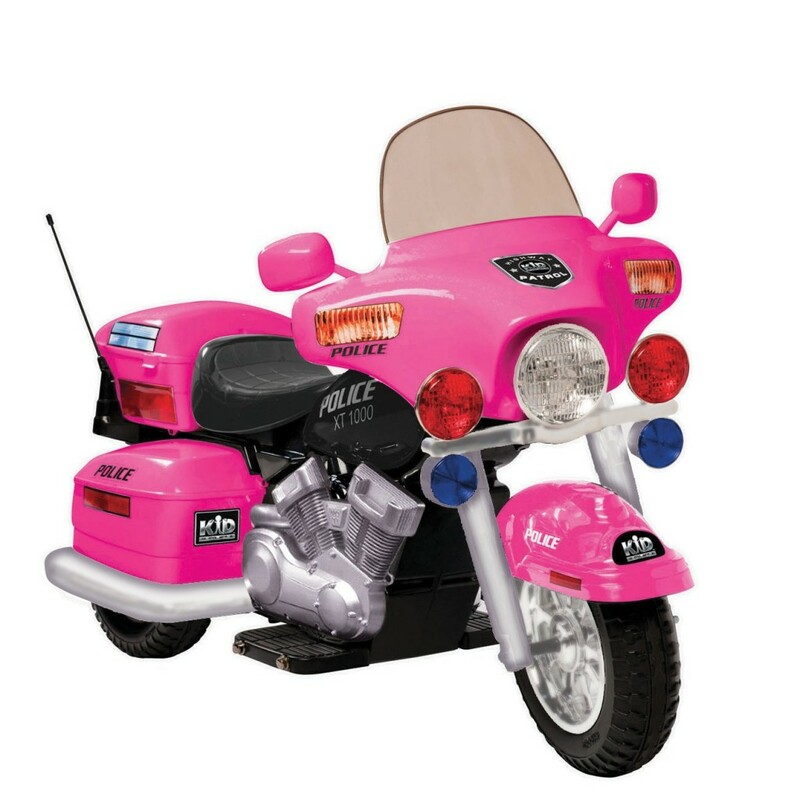 *How amazing is this gorgeous PINK police motorcycle for girls folks?? Looks just like a real bike! in PINK! This girls hot pink police motorcycle is one of the most gorgeous child motorcycles for girls ever!! I love the hot pink color! It fits little girls ages 5 to about 9 years old. It makes sounds and it also has a hand accelerator, just like a real motorcycle! I’m telling you, kids are riding the coolest bikes nowadays! Even toddlers can also ride a fun motorcycle! I found some pretty cool motor bikes for kids! How do you feel about giving your little boy or little girl a cute child motorcycle as a gift? Believe me, children also love to ride motorcycles! I found the most awesome child motorcycles and power scooters being sold online! From cool Harley bikes and police motorcycles for boys to cute pink motorcycles for girls! Even the little ones will be able to ride their very own motorcycle, as I also found the cutest toddler motorcycles as well! Since I am a girly woman of course my favorite mini-bikes and scooters for kids are the pink ones!! Some of those look as real as a real grown-up bike! 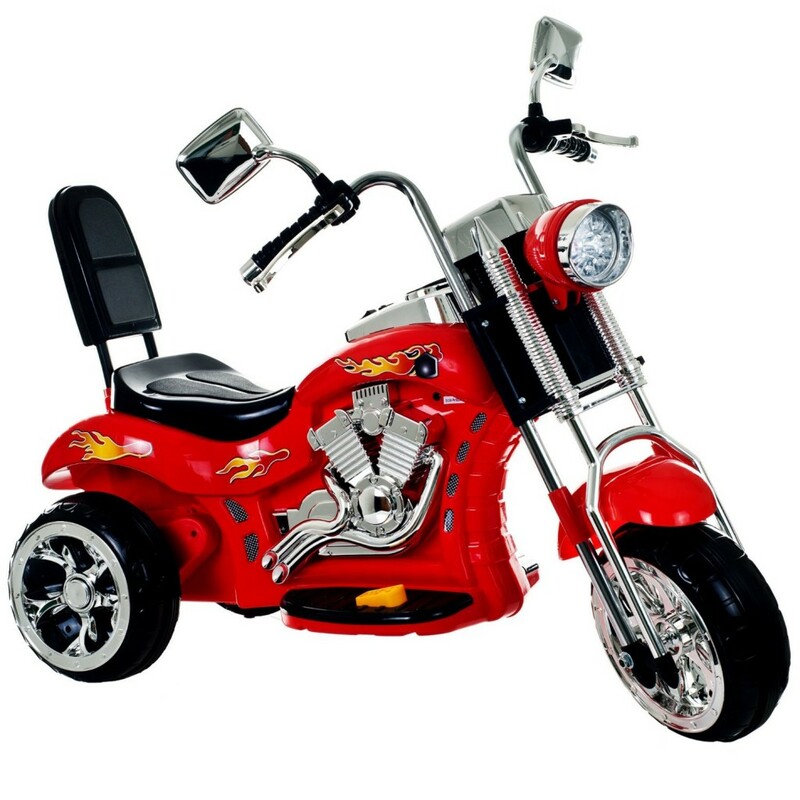 *This is a gorgeous and FUN red chopper bike for 3 year old boys and up! Cute PINK Motorcycles for Girls! I’m gonna start my selections of cute child motorcycles today with the girly pink ones, is that ok? Needless to say they make the most amazing riding gift idea for adventurous little girls! *This is a gorgeous pink and white scooter for 12 year old girls and up! It goes up to almost 18 mph! It takes approximately 4 to 6 hours to charge. Do not forget to also get a sturdy helmet for her! This cool scooter looks just like the ones for adults. Is that an amazing birthday gift idea or what? Razor Pocket Electric Pink Scooter for Girls! This cute pink motorcycle is for you! Next in line is this cute and also very pink electric scooter for girls ages 8 and up! It is an electric pink scooter that goes up to 15mph! It is fun and fast! Happy buyers love the fact that it is a quiet bike and very easy for children to balance on it and ride right away! Adventurous girls love this cute pink pocket razor bike! 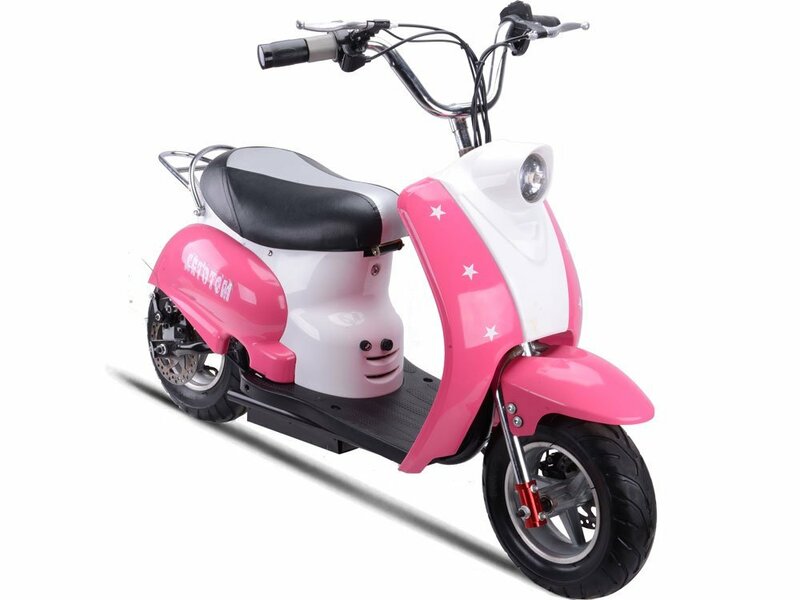 One of the cutest pink child motorcycles for girls! I think the best age is around 9 or 10 years old. Buyers also say it can ride on hills and tough surfaces as well! Don’t forget to get the cute pink helmet too! Cute Purple Scooter for Girls! Are you looking for fun child motorcycles for girls? 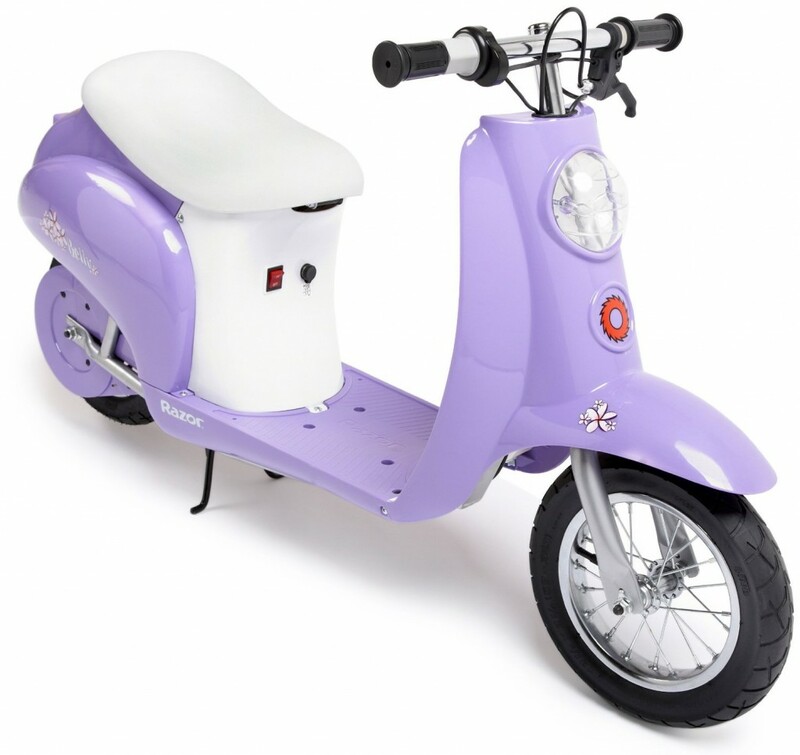 How about this cute purple motorcycle for girly girls? Can you see the cute flower print? Happy buyers say this cute razor scooter is one of the best gifts for their girls! They love how fast they can ride around their neighborhood! Did I mention there is a convenient storage space underneath the seat? This is one of my favorite electric scooters for girls! The recommended age is 12 years old and up, but some parents also buy this cute scooter for their 9 and 10 year old girls and they say it’s perfect for them! After you charge it it can go as far as 10 miles per charge! You can also choose it in pink or black. *This tween girl is giving an awesome demonstration riding this fun scooter everywhere! 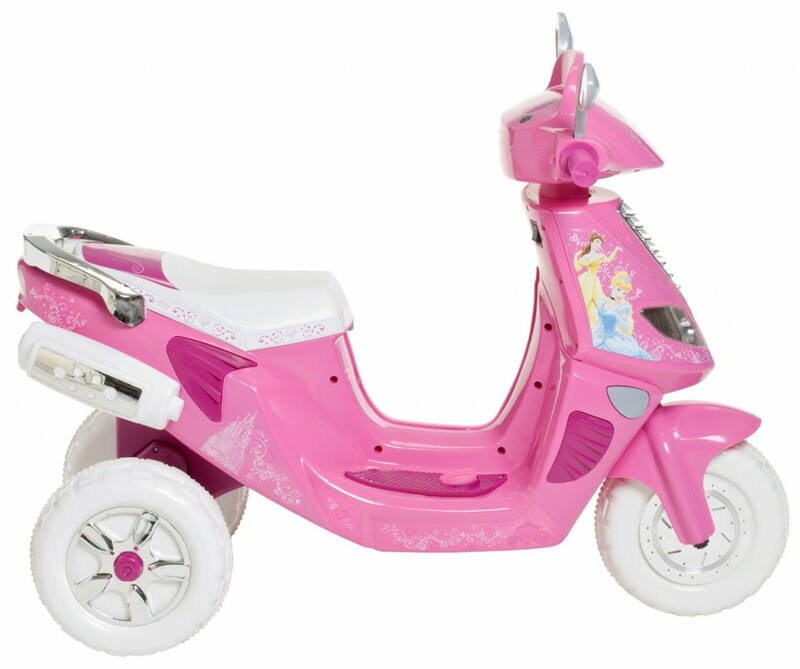 Cute Pink Disney Princess 6V Scooter for Toddler Girls! Now it’s time for the little girls ages 2, 3, 4 and 5 years old to ride their very own pink scooter too! This is an adorable pink Disney Princess scooter for sale! It makes fun sounds and it plays music too! When the music starts playing, cool light will start ‘dancing’ on the handlebars! The max. speed is about 2.5 mph, so it is pretty safe for toddlers. Parents and grandparents said it is a great gift idea for a 3 year old girl! Cool Police Motorcycle for Boys Ages 5 and Up! It is a cool battery operated police motorcycle for kids! Perfect gift idea for boys ages 4 to 8 or 9 years old! Boys love to pretend they are cops! One of the best child motorcycles for little boys! A happy buyer said his 5 year old boy LOVED it! This is the most beautiful police motorcycle for kids I’ve ever seen! It’s very realistic and your little boy is gonna have a blast playing cop! To add to his experience how about also getting him a cool police outfit? This cool bike goes up 5 mph and it also has super cool lights! Yes, it also makes cool sounds, of course! If you have a 5 year old boy and his birthday is coming up soon, this could be his gift! *This little boy can’t wait to ride his brand-new police motorcycle around the block! 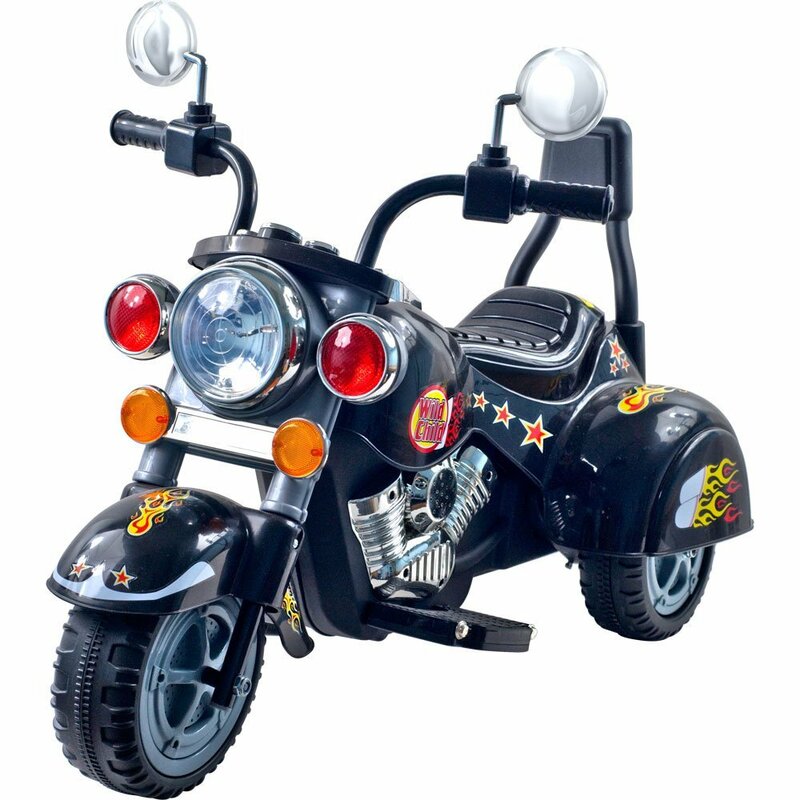 This is a very cute and fun Harley style motorcycle for toddler boys! It goes up to 3 mph and it’s perfect for your 2 or 3 year old little guy! Popular Razor Dirt Rocket Electric Motocross Bike for Boys! This is one of the most popular electric dirt bikes for kids! It goes up to 12mph without any pedaling! Boys go crazy with this awesome motocross bike! Needless to say this child motorcycle is one of the best gift ideas for boys! The max. speed is about 12 mph and it takes around 12 hours to charge. After it’s charged it will ride for approximately 30 minutes non-stop. Razor Pocket Rocket Fun Miniature Electric Bike for Boys! This is also another fun popular electric bike for boys being sold! It is pretty fast too, reaching speeds of up to 15 mph! The riding time is around 45 minutes non-stop and the charging time is around 4 to 6 hours. It fits young and old boys, up to 13 or 14 years old! Just be careful with the young ones, since this is a fast child bike! Sometimes a smaller child cannot control the bike. Make sure you also invest in a good helmet, to keep your kids safe! *This guy offers a detailed review of this mini bike! Kids Ride on Battery Power Electric Harley Motorcycle BLUE! Gorgeous Harley Motorcycle for Kids! It is a gorgeous and unique battery powered blue Harley motorcycle for kids!! How is that for a Christmas or birthday gift to your little boy? It supports children up to 90lbs. Probably one of the most beautiful electric child motorcycles around! Fisher-Price Power Wheels Harley Davidson Bike for Toddler Boys! This is one of the most bought fun motorcycles for toddler boys by parents! It’s a very cool and very affordable Harley Davidson bike for boys! I love this little boy’s shades! He is ready for a ride! The max. speed is 2.5 mph so it’s perfectly safe for your 1 or 2 year old little boy! Most parents and grandparents are very happy with this cute bike and they all say their 2 year old boys loved it! It is also a very sturdy child motorcycle and very easy to put together! Cute Pink Motorcycle for Girls! It’s a pink Harley bike for girls!! To all biker little girls ages 3 to 7 years old, this cute pink electric Harley motorcycle is for you! They love to ride their Harley bike just like daddy does! The max speed is about 4mph, so it is perfectly safe! A happy buyer said it was the coolest gift idea ever for her 5 year old girl! Now they can have a Harley too! Cool Red Honda Bike for Boys! I have always been fascinated by riding toys! This is such a cool red Honda bike for kids! It is battery operated and it also has real working lights! Fun yellow electric bike for the little ones! This is a cute and lots of fun toddler electric motorcycle! It fits toddlers and small children up to 5 years old! Super cool dual pedal motorcycle for children! Is that a chopper motorcycle for kids? It is a double chopper pedal go-kart bike! Two lucky kids will be able to enjoy this beauty! Great gift idea for twins!! It fits kids as young as 5 years old up to adults! *I hope you enjoyed these fun child motorcycles from here and were able to choose one for your child! Best Electric Power Scooters for Kids!